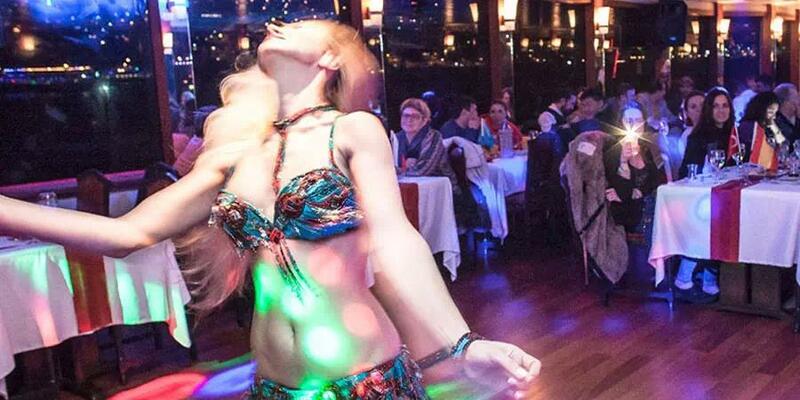 Istanbul Dinner Cruise with Ottoman Night show, navigate the Istanbul Bosphorus Straits on a 3.5-hour dinner cruise, and enjoy spectacular views of the Ottoman palaces and Blue Mosque under the magic of their evening illuminations. Enjoy unlimited drinks, and live entertainment on board. We are going to pick up you from your hotels and transfer to our private boat between 19:30 and 19:45. You will be greeted and set on board by our staff. The cruise will start by the Golden Horn which surrounds the Old City along the north side. After leaving behind the calm waters of Golden Horn, we will sail through the legendary Bosphorus where a breathtaking picturesque view of Istanbul is waiting to go along. Even for the one who has already been on a day cruise to Bosphorus, seeing Istanbul by the sunset will be definitely an unforgettable experience. 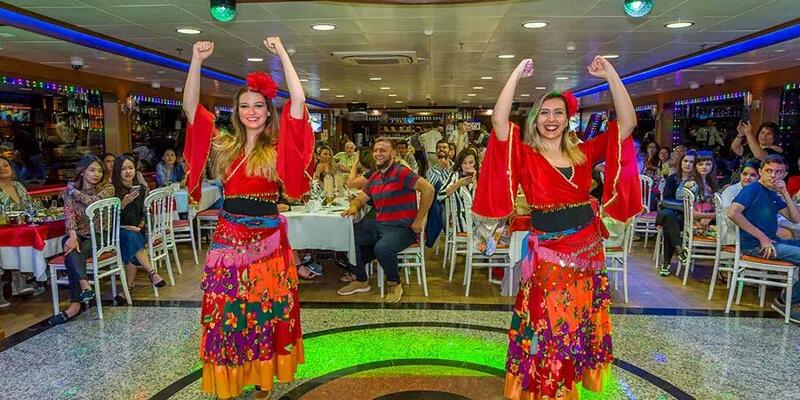 During this great cruise, you will enjoy our open buffet with salads, delicious hors d'oeuvre, grilled meat balls, Chicken Shish Kebab, Adana Kebab and fruit. 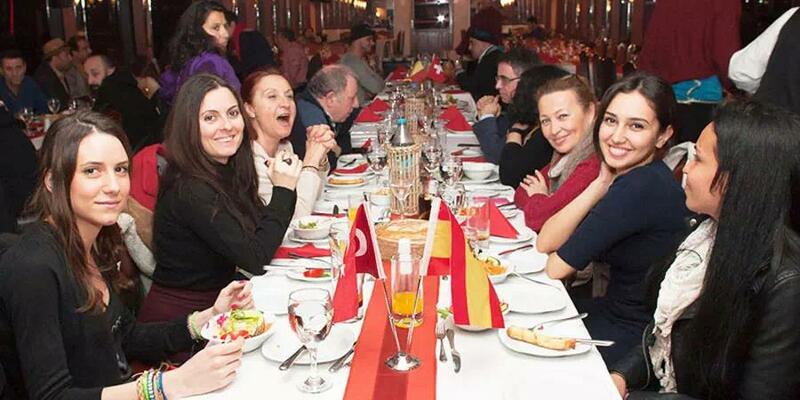 Our program starts with typical Turkish songs while you taste the delicious foods. 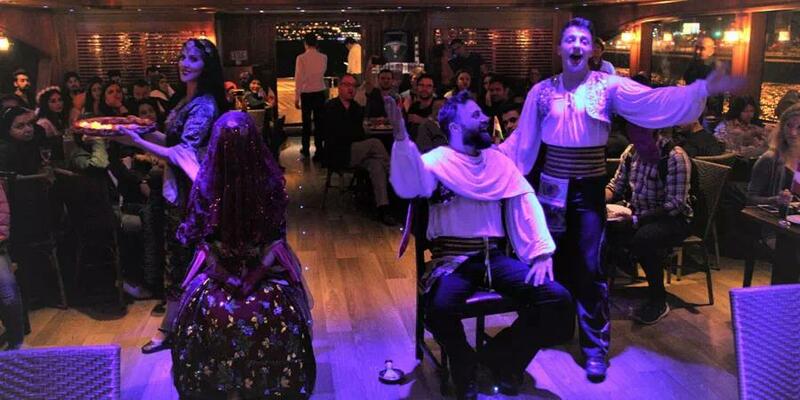 A little while, once the lively timbres begin to catch you, our professional folklore team will present a potpourri of the most famous Anatolian dances. 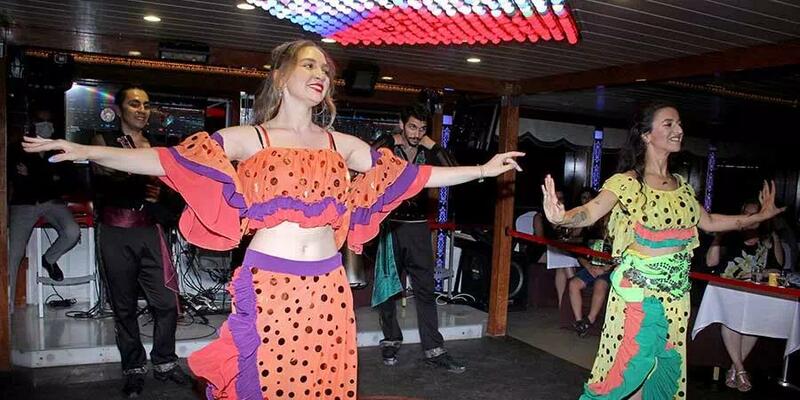 Little before you find your self going with the rhythm, a breathtaking performance of Belly Dance Show will enchante the nigth. We promise, you will ask to stay more once we will be back at the harbour around midnight. 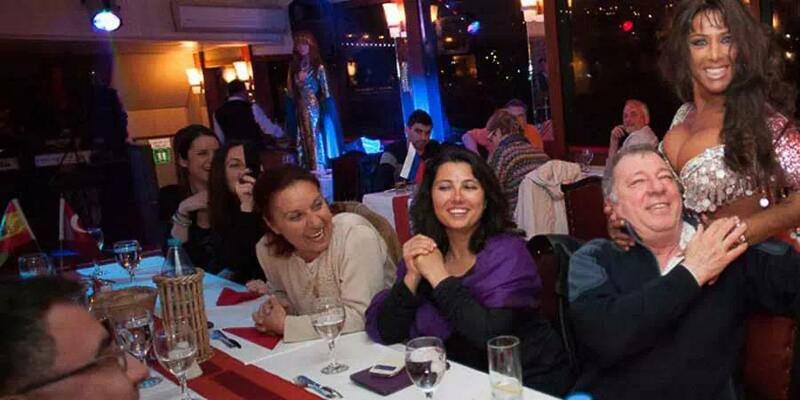 *Alcoholic Drinks cover Wine, Beer, Rakı, Vodka and Gin. Whirling Dervish: The Sema Ceremony represents the human being’s spiritual journey and we bring you a hint of one of the remarkable ways to achive this: the way of Rumi, the great Muslim mystic and poet. 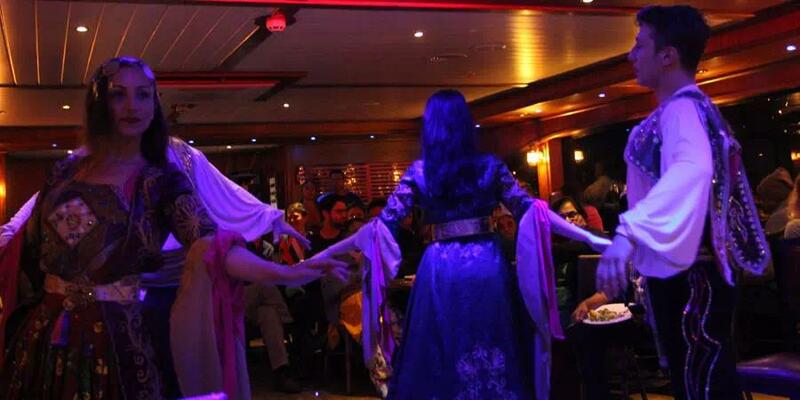 Belly Dancer: Let us surround you with Turkish dance culture and sense the richness of the Turkish music and dance. 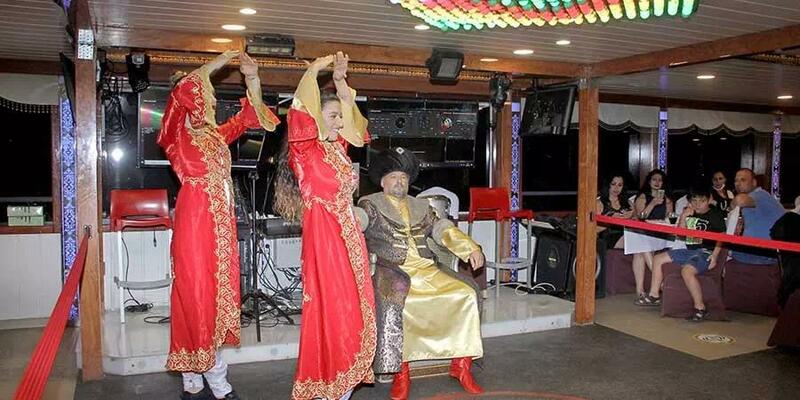 Turkish Folk Dance: We proudly present the rich Turkish folcloric traditions which have been kept alive for centuries due to the characteristics of Turkish people. 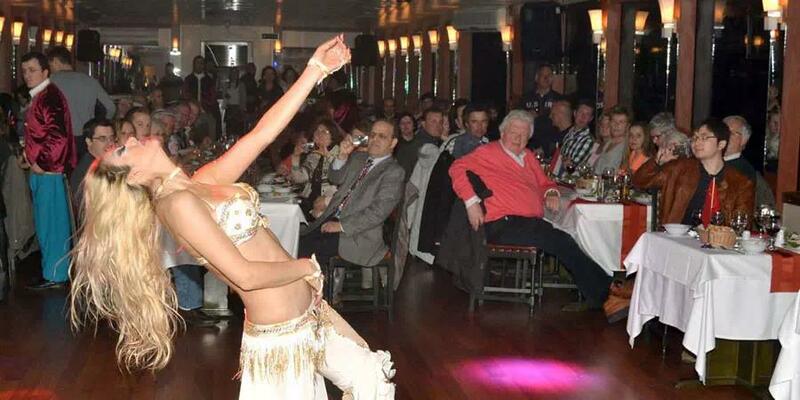 Harem Belly Dancer: The queen of the belly dance. No tour guiding service provided during the tour. English and German-speaking staff are available onboard for customer service. 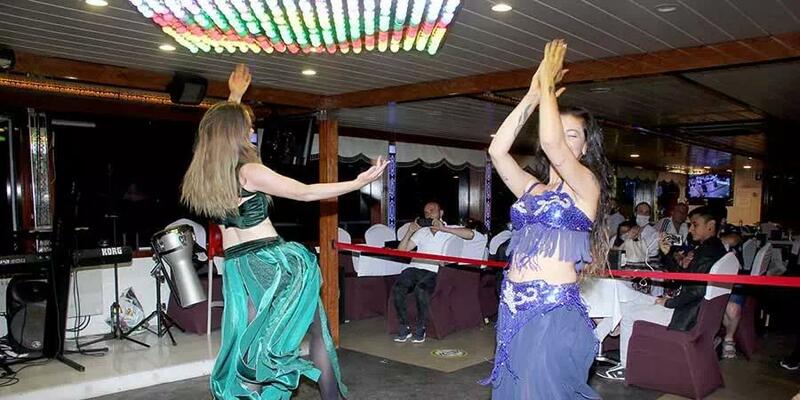 What is Turkish Belly Dance?